Artwalk last weekend was a huge success from the number of visitors estimated at over 400. I got to exhibit with two friends of mine: Joy Price-watercolor http://siskiyouartscouncil.org/joy-price/ , and Dorthea Schoenstien-oil.http://siskiyouartscouncil.org/dorothea-barlett-schoenstein/ You can see us in the city council chamber for the day. Birds are on a feeding frenzy: hummers, their fat little bellies pressed against the feeder rail, sucking down the sugar water. Blue and scrub jays call out to Bruce, “peep-squawk” “feed-me-peanuts.” The scrub jay can carry two nuts at once if they are small. It thinks it’s being clever, burying them on the edge of the compost pile in deep duff. I’m watching the whole time from my cozy nook in the kitchen. Finches arrive in a cloud of fluttering, peeping wings, harvesting every last seed from the gaunt, bent sunflowers. Everyday Bruce and I pick a 5-gallon bucket of apples and process them for our freezer. That means Bruce runs the ingenious hand-crank, mechanical peeler and slicer. We pack the apple slices into freezer bags with a little sugar, ready to make strudel or pie all winter. We have flats of whole, perfect apples in the shed where they should keep a long time in the cold. Mind you, these aren't any old apple. These are artisanal apples that hail back to the day when Dunsmuir provided fresh apples to the burgeoning population in San Francisco during the gold rush of 1849. The fragrant, juicy fruit have a faint blue tinge to the red, prominent now it has frosted, making them a deep purplish-red compared to the sunny golden red of summer and a delicious, apple-flavor that reminds you of what apples tasted like when you were a kid. In Dunsmuir today the sun is shining, its 50-degrees F (10 C), kids are walking home from school past my house. Black-headed Oregon juncos have arrived. During the summer, they live high up in nearby mountains. The snow drives them down to Dunsmuir for the winter. They’re picking through the remnants of the dry, sunflower stalks. Leaves on the oaks and maples are still mostly green with patches of gold. Here and there a red flame of dogwood or ash. The dead-looking, dry grass has sprouted fresh, green blades overnight. In China the Golden Week and National holiday, Guoqing jie and Huangjin zhou, has passed. On October 1 Chinese celebrate the founding of their Peoples’ Republic of china in 1949, marking the first day of the week long vacation. Many Chinese travel to visit local and distant attractions during this most beautiful time of year. Forbes says Chinese consumers are shifting from luxuries to camping. Chinese media reports more than four million people visited the nationally monitored scenic spots, a rise of 23.7 percent from last year. Campsite tourism and scenic drives are a new trend for re-balancing their economy as the Chinese lurch towards a more sustainable growth factor. Remember this summer, when I visited southern California? I got to see my family and a friend from Beijing, Feng, and her son, Alec, and her husband who was attending a conference in Anaheim. This woman befriended me at Tsinghua campus. She worked in the housing office and would help me with things because her English is very good and because she is good hearted. I was sorry to leave Feng and the many Chinese and ex-pat friends I made in the short ten months of my tenure. Writing this blog helps me massage that sore spot in my heart where Beijing sticks like a dart. 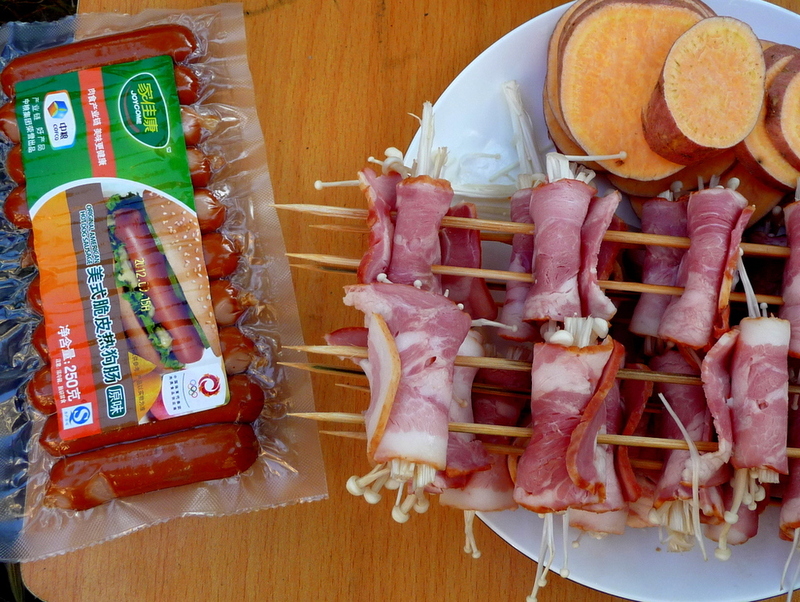 These are Feng’s recipes for her family camping barbecue. 1. Lamb skewers Sheep hindquarters, the best little fat. Appropriate cut into small pieces (2 cm or 1-inch) marinated. Marinade: onion, white wine, salt, sugar, a little, put some dry chili marinade if you like spicy food. Add to the Marinade Drizzle a little oil. Generally marinate for 30 minutes to 1 hour. Before grilling, sprinkle meat with some chili powder and cumin powder. Brush with any favorite sauce or dressing. 2. Grilled chicken wings Wings can be marinated with a ready-made barbecue sauce, pickling spices and mutton. Brush a small amount of honey on the outside skin will be crispier. You can use the Drizzle oil or not according to taste. Vegetables good to grill are mushrooms, beans, eggplant, garlic, leek, peppers, sweet potato slices, and potato chips. Brush a little cooking oil while they grill will cook them faster, but not easy to paste. Brush with any favorite sauce or dressing. Fast Flavors: butter + a little oil + a little sugar, spice powder, sprinkle on the vegetables some for the fragrance. Do not buy meat with flesh attached off-the-shelf. Some people like to buy chicken gristle + Chicken already skewered in the package for convenience. I received a book in the mail from my friend Feng. Holding the white and green bubble cushion China Postal envelope with red stamps, I was excited with anticipation at seeing her father and her sister’s book on Taoism had arrived. Feng’s father was Dean of the Administrative Law Department at Northwestern College of Law and has published numerous academic books and journal papers. This book about Taoism is his first attempt to capture that elusive quality of the Tao. Also an author is Feng Jingwen, his daughter, who currently works as a faculty at the Law School of ShanXi University of Finance and Economics. Ms Feng is distinguished for having studied law, receiving a BS at the University of Shaanxi and a MS from the Law School at Shanxi University where she now works; she has published articles in the Social Science Journal. 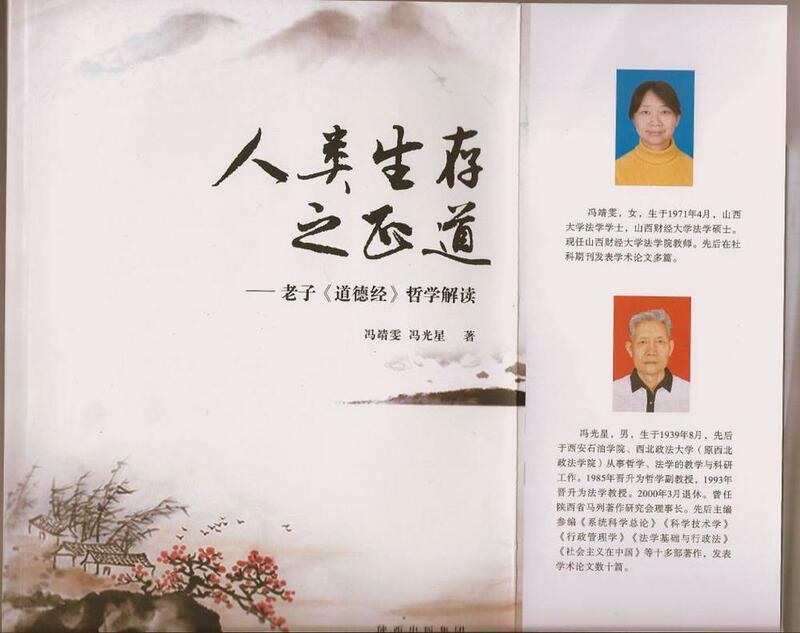 348 pages, this book can be purchased from Shaanxi people's Publishing House ‘issued section.’ Feng says, “In XI'AN my parents’ apartment has some books, if someone want to buy one. They only provide books, but can’t provide receipt. The publisher said because these kinds of books are professional, too bad sales, the author may sell books, but does not provide the invoice. He-he, Sounds a bit complicated.” If anyone wants to get a book from Feng, let me know and I will forward your request to her. After the first strong rain, Oregon stream fairies can be glimpsed standing in ditches next to roads looking ephemeral.